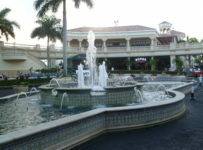 Friday, Sept. 25 – Gulfstream Park will have ten races today with a first post time of 1:15 p.m. The featured eighth race is a $62,500 optional claimer at 7 ½ furlongs on turf for 3-year-olds and up with a $46,000 purse. The race has eight entrants, with Social Request listed as main track only. Joes Blazing Aaron and Rizwan, two horses that usually race in stakes, are likely favorites. Joes Blazing Aaron has won four of his 12 starts on the Gulfstream turf–mostly in stakes or in high-end allowance/optional claimers. 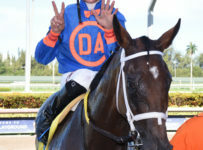 His most recent win was on June 18, in a $62,500 allowance/optional claimer at one mile on the Gulfstream turf. Joes Blazing Aaron can be expected to seek the lead under jockey Edgar Prado. Peter Walder trains the 7-year-old gelding, who is entered for the $62,500 tag. Rizwan’s last win was on May 2 in the English Channel Stakes at 1 1/16 miles on the Gulfstream turf. Since then he has finished third or better in three of his five starts, all in stakes at Gulfstream. Jose Caraballo will ride Rizwan, a 3-year-old colt, for trainer Phil Gleaves. Rizwan is not in for a claim. Tap it Off, Rompin Reid and Bluegrass Singer also are good prospects to be in the exacta or trifecta. *There will be a $62,020 carryover today on the Rainbow 6, which requires picking the winners of each of the day’s last six races. It is a 20-cent per combination only bet with multiple horses permitted in each race. For example, a ticket with two horses in each race has 64 combinations and costs $12.80. On other days it divides 70 percent of the day’s Rainbow 6 bets among tickets with the most winners. That is almost always six of six. On days when there are no tickets with six winners, that payoff is divided among tickets with the highest number of winners. On some days this summer, there have been no tickets with more than five winners or even four winners. On days with multiple winning tickets, Gulfstream puts 30 percent of the Rainbow 6 pool into the carryover for the next day. * Above Fashion beat Kandoo by 1 3/4 lengths in Thursday’s feature, a $75,000 allowance/optional claimer at six furlongs on dirt for 2-year-old fillies. Above Fashion, at 5-1, was ridden by Edgard Zayas and won in 1:11.80 on the track listed as fast. Kandoo, the1-2 favorite, finished six lengths ahead of High End Queen. Neither Above Fashion nor Kandoo was in for a tag. There were no claims out of the race. * Thursday was a rare day when neither jockey Tyler Gaffalione nor trainer Ralph Nicks had a victory. Eddie Castro and Zayas each rode two winners. Castro has 50 wins, placing him second to Gaffalione in the standings for Gulfstream’s summer meet that will end Oct. 3. Zayas has 26 wins and is fifth in the standings. He missed about a month of the meet with a broken collarbone. Trainer Antonio Sano had one win on Thursday. He has 26 wins for the meet, second to Nicks who has 31. 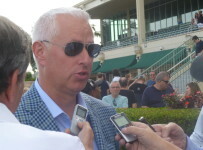 * Gulfstream will have two $75,000 stakes races on Friday, and two $75,000 stakes races on Sunday. The Saturday stakes are the Groomstick at seven furlongs on dirt for 3-year-olds and up and the Panama City at one mile on turf for fillies and mares 3-years-old and up. The Sunday stakes are the Mr. Steele at one mile on turf for 3-year-olds and up and the Added Elegance at seven furlongs on dirt for fillies and mares 3-years old and up.